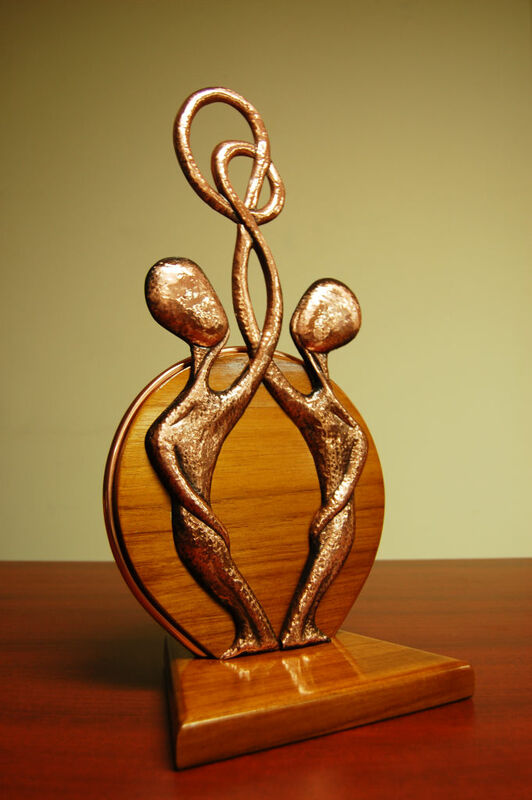 The trophy presented to all participating Mentoring by the Masters “mentors,” in recognition of their contribution and legacy to the Trinidad and Tobago arts and culture landscape. The entire Mentoring by the Masters series is built upon honouring legacy and ensuring continuity of certain skills within the local landscape. Since inception of the programme, each selected mentor is presented with a hand-crafted, sculpted trophy at a special award ceremony at the close of each mentoring cycle. We thought it would be wonderful to highlight the artist tasked with crafting these trophies: Glendon Morris, a master in his own right in the area of metal work and carnival arts. As we countdown to this year’s Award Ceremony, let’s take a behind-the-scenes look at the birth of the Mentoring by the Masters trophy. “…[this] award was inspired by the work of the late Ken Morris, who has contributed to the local art community and his aesthetic has had a great influence on its design. 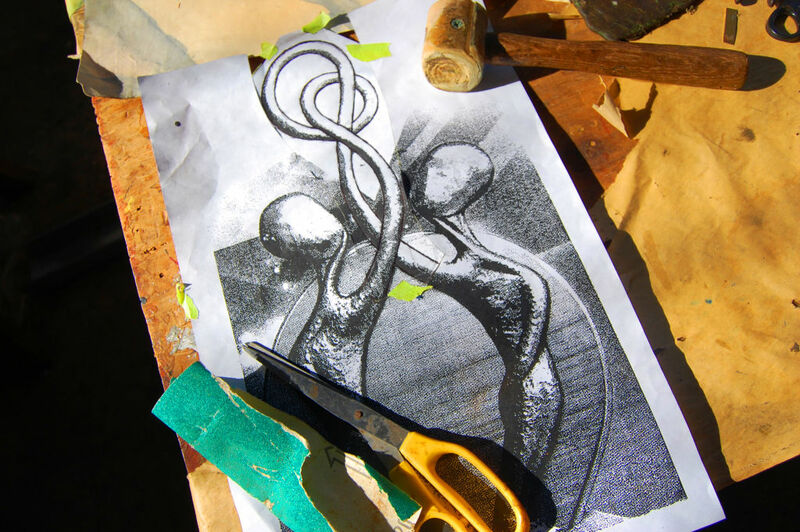 An Artist’s Sketch of the MBM Trophy at the Workshop in Belmont. 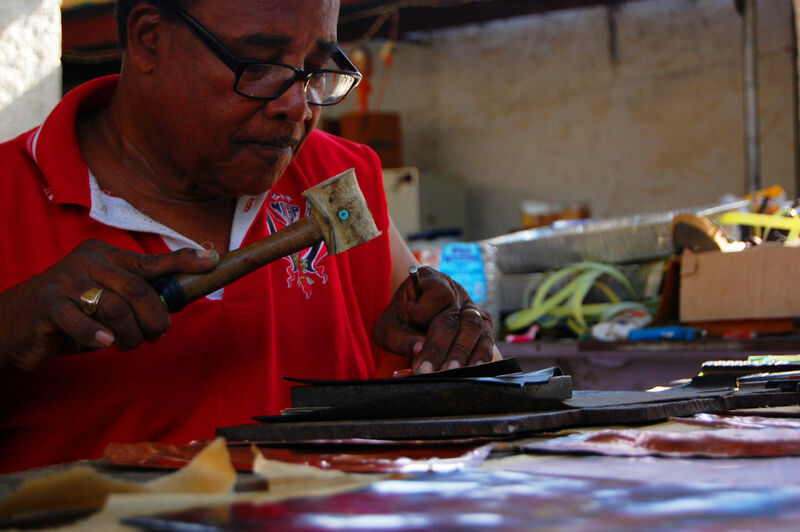 Glendon Morris is the son of the late Ken Morris (1924–1992), one of Trinidad’s most sought-after metal-work and costume construction masters to date. The career of the self-taught Morris Senior spanned over three decades and included producing work for fellow masmen such as Peter Minshall, Stephen Lee Heung, fellow Belmont resident Jason Griffith and celebrated visual artist Carlisle Chang. Ken Morris’ repousse technique (hammering copper relief from the reverse side of the material) was unrivalled and has been passed down a generation to his son. Ken Morris’ contribution to Trinidad and Tobago arts and culture is well detailed in an interview published in Issue 65 of the Caribbean Beat Magazine. As with his father, Glendon Morris learned his craft by a combination of regular apprenticeship at his father’s mas camp and self-experimentation. Copper work is the specialty skill that Morris brings to the creation of the Mentoring by the Masters trophy. A now fading architectural treasure across the island, a “gingerbread house” at 107B Belmont Circular Road is what has become the site of his workshop, previously the mas camp of his father. This also happens to be one of the listed sites of the Belmont Heritage and Musical Walk Project of the Remember When Institute of the Culture Division. We visited this very same workshop in July 2015 to get a glimpse of the master at work on this year’s trophies. Glendon Morris is an accomplished cultural treasure and artist, with work produced for Peter Minshall, places as far as the embassy in Beijing, China, in addition to more recent years of traditional mas titles and accolades, and holding key advisory and executive roles for the National Carnival Bands Association. Mas work from the past at the Workshop. The Artist at work surrounded by past creations of the Morris clan. Mentoring by the Masters Trophies on display onstage at the 2014 Award Ceremony. Dr. The Honourable Lincoln Douglas, Minister of the Arts and Multiculturalism presents Ms. Lindy-Anne Ritch with her award at the 2014 Award Ceremony. The Mentoring by the Masters Programme is honoured to have the work of Glendon Morris at the forefront of our project.